This article first appeared on the FQXi community website. FQXi are our partners in our Information about information project. Click here to read other articles related to John Wheeler's concept of "it from bit". "Balancing the glory of quantum achievements, we have the shame of not knowing "how come." Why does the quantum exist?" – John Wheeler, in the New York Times (December 12, 2000). As a schoolboy, Giulio Chiribella dreamed of becoming a composer, someone who could imbue music with the "deep ideas of our age." He studied the piano at a conservatory in Mantova, Italy, and even began working towards a diploma in music composition. But soon he hit an artistic wall. "I felt that in order to be a complete artist I needed to know about the foundations of our knowledge of the world," he says. "How could I ignore the foundations of physics and of all we know about reality?" To that end, Chiribella, now a quantum physicist at Tsinghua University in Beijing, China, studied physics and mathematics and quickly got hooked. The search for deeper foundations has now led him and his colleagues, Giacomo Mauro D'Ariano and Paolo Perinotti at the University of Pavia, in Italy, to rewrite the rules at the core of theoretical physics. They have identified five fundamental principles common to both the 'classical physics' that governs everyday objects that we see around us and the bizarre quantum rules that control the behaviour of particles in the subatomic realm. It is a feat that is akin to finding a basic set of musical tunes from which any elaborate symphony can be composed. According to this model, the difference between the quantum and classical worlds comes down to one simple extra feature, which they dub the "purification principle" – an axiom that brings the information content of quantum systems to centre stage. With this in place, they are able to explain many of the other strange properties that we see in quantum experiments and why our quantum equations work so well. Their findings could help us understand the origin of time's arrow and may even have implications for physicists developing algorithms for quantum computers, which are expected to outperform today's standard machines. Quantum mechanics is one of our most successful physical theories: It allows us to describe elementary particles and fundamental forces, to understand chemical reactions, and to construct lasers, transistors, and computers. Yet it has, in the team's words, an "embarrassing problem": the rules of quantum mechanics are an enigma because they are not derived from intuitive principles. While you can describe the laws of classical mechanics, set out centuries ago by Isaac Newton, in terms of easy to understand concepts like the position and speed of particles, quantum mechanics is built from a handful of abstract axioms, which themselves are inspired by the weird experimental observations made by physicists in the early twentieth century. In order to use quantum mechanics, you can just accept these strange features as given, without really having any deep insight into how or why they arise – or even to what entities the laws refer. "It is hard not to suspect that, despite all our experimental and technological advancement, we are completely missing the big picture," Chiribella, D'Ariano and Perinotti wrote in a paper outlining their new formulation, in 2012 (Entropy, 14(10), 1877-1893 (2012)). "We cannot even tell what quantum theory is without resorting to…abstract language… What does this mean? Why should Nature be described by this very special piece of mathematics?" To appreciate just how esoteric the mathematics behind the theory is, we need look no further than the central equation that physicists use for calculating how a quantum system evolves, before it is measured, which was proposed in the 1920s, by Austrian physicist Erwin Schrödinger, one of the founding fathers of quantum theory. "The way Schrödinger discovered this equation was an adventure," says Chiribella. One of the most famous quantum oddities is that, in some experiments, particles display wave-like characteristics—for instance, producing interference patterns as they interact. Schrödinger realized that the equations of classical optics (which deal with how light waves interfere and are diffracted when they pass through slits and around barriers) seemed to describe the motion of individual particles. So, he intuited that the equation describing the evolution of a quantum system would be similar, and he was right. This equation forms one of the central postulates of quantum theory, but it is not based on any fundamental principles, says Chiribella. "It's a trick that worked out well," he says, "but now we would like to see what this means." In 2010, Chiribella, D'Ariano and Perinotti identified a more commonplace set of alternative postulates from which all other physical properties—both classical and quantum—could be derived (Phys. Rev. A 84, 012311 (2011)). A crucial goal was that the fundamental physical meaning behind their postulates should be easy to grasp. For instance, their first postulate pertains to causality and says that the outcome of an experiment should not depend on operations made after the experiment has been completed—something that most people would agree on based on everyday experience. Their five axioms are valid both for classical and quantum systems. It is the sixth postulate, dubbed "the purification principle," which lies at the heart of the team’s alternative take on quantum theory. It marks out why particles behave so differently at the subatomic level compared with objects we see around us. The purification principle homes in on the information content of a quantum system. Quantum physicists already differentiate between systems that are in a "pure state" and those that are in a "mixed state" based on how much information it is possible to glean from them. To see the difference between these two types of states, you can think about the quantum property of entanglement: In quantum experiments, it is possible to prepare two particles in such a way that measurements carried out on one immediately affect the properties of its partner. When these two entangled particles are taken together, they are said to be in a pure state—that means that you know all there is to know about the system. But if you study the evolution of any one of the entangled pair in isolation, you are said to be dealing with a particle in a mixed state; you’d never know all there is to know about that one particle until you include information about its partner. The idea behind the purification principle is that every system in a mixed state, whose properties you cannot fully know about, is part of a larger system that is in a pure state. Using purification and the other five axioms, the team derived the other basic (and bizarre) rules that govern quantum systems. That includes superposition—the feature that says that before a quantum particle is observed it can exist in a superposition of multiple states, potentially being in two places at the same time, for instance. They have also derived the rule set out by German physicist Max Born for calculating the probability of getting a certain outcome when making a measurement of a quantum system. By contrast, under the standard formulation of quantum theory, the Born rule must just be assumed to be correct. With an FQXi grant of almost $50,000, Chiribella is now investigating the deep connection between purification, quantum dynamics, and other fundamental features of quantum mechanics. Purification potentially offers help for understanding the fundamental nature of time too. One of the biggest puzzles for physicists is why we see an arrow of time that marches in one direction, from the past to the future, whereas the equations that govern the behaviour of subatomic particles are reversible—equally likely to occur backwards or forwards in time. So how is the direction of time imposed? The standard explanation is to look to the science of heat and energy transfer, thermodynamics. The equations of thermodynamics are irreversible. In particular, physicists relate the arrow of time to the direction in which the entropy of a system—or its disorder—increases. But while entropy gives a possible explanation for how time’s arrow arises, this discrepancy between microscopic reversibility and macroscopic irreversibility bothered the founders of the field. "Thermodynamics was clashing with the leading paradigm of fundamental physics, that dynamical equations should be reversible at the fundamental level" says Chiribella. But, Chiribella and colleagues asked, what if a system seems irreversible only because we are studying a part of the system (analogous to a mixed state) and if the whole system (analogous to a pure state) were taken into consideration, then its evolution would be reversible? "Purification offers fundamental physics the possibility of reconciling irreversible evolution, which is something we actually we see, with the goal to write down the fundamental equations that are ultimately reversible," says Chiribella. This could also be the key to understanding the fundamental origin of the Schrödinger equation, which describes all the reversible dynamics in quantum mechanics. Indeed, it naturally emerges from their axioms that reversible evolution can have only one mathematical form, "and this mathematical form is the form of the Schrödinger equation," says Chiribella. So, that's the easy answer for why the equation looks the way it does. But Chiribella is after some deeper insights. His next question: Is there a relationship between the dynamics of quantum systems, as given by the Schrödinger equation, and the features of quantum systems that, in theory, power quantum computation? To investigate, the team has considered one of the landmark algorithms, originally laid out by computer scientist Lov Grover, in the 1990s, that helped to define the potential of quantum computing. Grover was interested in the problem of searching N boxes, to find one particular box containing an object of interest. A classical search, on average, will perform on the order of N operations (where an operation equals opening a box) to find that special box —that is, you will have to look inside each box, one at a time. But Grover’s quantum search algorithm can do it using approximately √N operations, because quantum computers can effectively search multiple boxes simultaneously. Could this speed-up be derived from fundamental principles, just based on the idea that a quantum computer is a "pure and reversible computer" in Chiribella's words? There are indications that this should be possible. A classical computation, if it has to be reversible, has to keep track of all the information from the previous step in the calculation, and it has to carry this all the way through to the end. But a quantum algorithm doesn't have to suffer the same way because the computer can be "ignorant" of one property you don't care about, and can keep track only of the information that will lead you to find the result. "Ignorance becomes speed," says Chiribella. Caslav Brukner, a quantum physicist at the University of Vienna, Austria, says that with the help of the purification principle it is now possible to ask profound questions that otherwise could not be articulated mathematically. Say, you made a measurement of a quantum system using a measurement device, and get one result. Then some "super-observer" makes a second measurement that includes both the system that you looked at and the measurement device, itself. If quantum mechanics applies to all objects, then you would expect these two results to be consistent—and the purification principle provides a clear explanation: The first measurement is analogous to working with a mixed state, and the bigger measurement to a pure state. "The purification postulate is a deep statement that ensures that these two descriptions are consistent with each other," says Brukner. Lucien Hardy of the Perimeter Institute in Waterloo, Ontario, Canada, is also impressed by the work. Hardy has himself worked out a set of axioms from which to derive quantum theory. "Their papers are technically much more sophisticated than the papers that came before, and there are lots beautiful theorems," says Hardy. 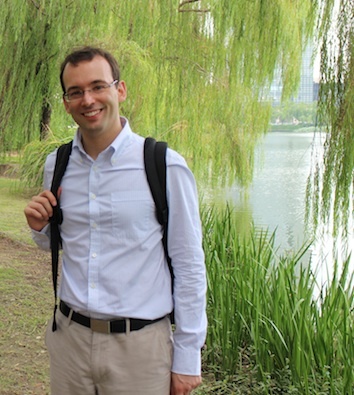 With his FQXi grant, Chiribella wants to see if he can find a deep connection between purification, the dynamics of quantum systems, and quantum information theory. Ultimately, for Chiribella, it's the aesthetics of purification realised in the world that drives him—much like bringing a piece of written music to life by playing it on the piano: "If you really like beauty in a mathematical theory, it is so much more beautiful when you see that this is something that really happens in the physical world," says Chiribella. So how is the direction of time imposed? You will know you are on the right track when you find that the same explanation may answer the remaining questions as well. The answer to the question above is actually rather simple as you may find at http://spacetime.nu/TheArrowOfTime.html - it's just a matter of the direction of least resistance.